For alternative betydninger, se Squid. En dc-squid eller dc-Superconducting QUantum Interference Device er en kvantemekanisk komponent, som består af 2 serieforbundne Josephson kontakter i en lukket ring. Dc-squid kan også have flere end 2 Josephson kontakter. Dc-squiden blev teoretisk designet i 1962 af B. D. Josephson mens han udviklede af Josephson kontakten eller ac-squid. Både ac-squid og dc-squiderne fungerer som superledende kvanteinterferometer. Dc-squiden anvendes til at måle ekstremt svage magnetfelter. 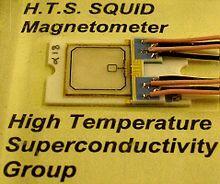 Dr. John Bland’s explanation: Superconducting Quantum Interference Device (SQUID). Stanford: What is Gravity Probe B?, The Geodetic Effect: Measuring the Curvature of Space-time Citat: "... Third, most important, Gravity Probe B investigates the gravitational action of moving matter..."
2004-09-09, Sciencedaily: NASA Gravity Probe B Mission Enters Science Phase, Ready To Test Einstein's Theory Citat: "...The magnetic field surrounding the gyros and SQUIDs (Super-conducting QUantum Interference Device) has been reduced to 10-7 gauss, less than one millionth of the Earth's magnetic field-the lowest ever achieved in space...The gyro readout measurements from the SQUID magnetometers have unprecedented precision, detecting fields to 10-13 gauss, less than one trillionth of the strength of Earth's magnetic field..."
Denne side blev senest ændret den 24. juli 2018 kl. 22:08.